Norfolk Southern Engine 9591 puts on a smokefest! While passing by the Elkhorn Inn in outside of Landgraff, West Virginia, this conductor is nervously nursing his sick locomotive #9195 to the Landgraff crossing. It is there he will wait for “rescue power” to get him out of this jam. 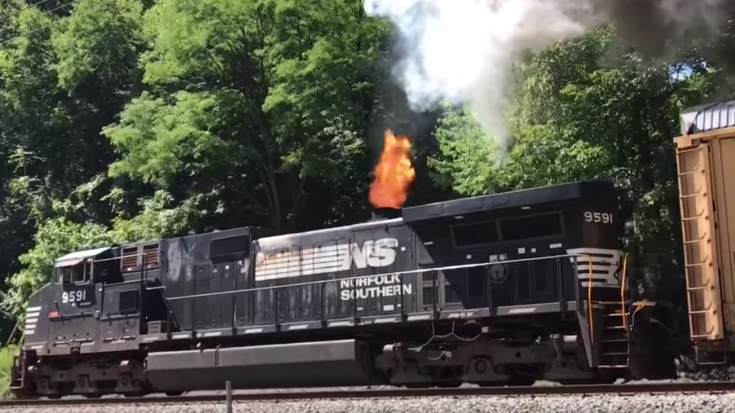 Here is another example of what they call a “blown turbo” on this Norfolk Southern locomotive. The engineer seems well aware of the situation, but continues nonchalantly on down the line as if nothing is happening. Blown turbo engines are a common problem when the seals or gaskets get worn or cracked. The seals are made of rubber that is high heat resistant. When the seals become brittle over time, they crack and allow oil from inside the turbine to leak out. This is turn takes away the lubrication on the bearings which ultimately seize up and cause the smoke you see. It looks this was the day that Norfolk Southern #9591 became an honorary steam locomotive! Let us know if you have ever witnessed one of these turbos smoking down the line. We would to hear about your experience!